Have you heard that it’s National Diabetes Awareness month? Well it is! I’m all about the wearing blue and getting people to raise money and sharing what diabetes is really like. 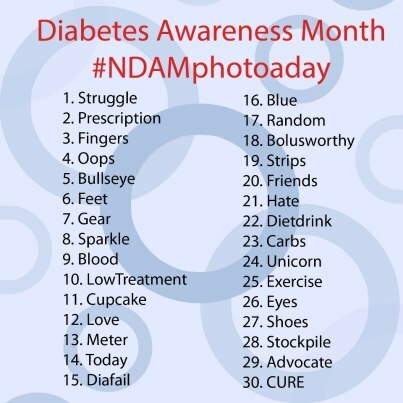 I’m still not gung-ho about getting in peoples’ faces, but this new instagram photo-a-day prompt about living with diabetes is right up my alley. Sarah, Cara and Abby came up with it and I’m very excited to participate. If you don’t have instagram (or twitter) and want to participate, I’d LOVE for you to post your pictures. And even if you don’t do it every day, pictures are pictures and they help spread the word!